Click here to view the 2018 video. 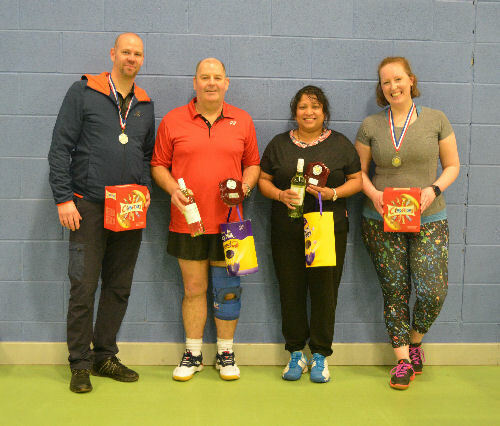 The fifth and final Borders Handicap Tournament of the season was held at Earlston High School games hall on Sunday, 17th March, 2019. 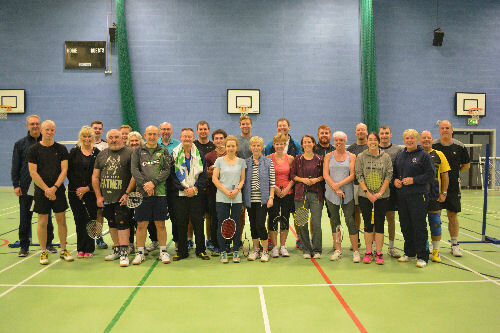 A great afternoon of badminton enjoyed by all the participants. The SSBU Secondary Championships were held at The Bell�s Sports Centre, Perth on 9/10th March, 2019. Boys Singles: Kieran Burns lost to Thomas Calder 21-15, 21-18 in the 1st round. Kieran lost the final of the consolation knockout to Arjun Rajagopal 21-18. 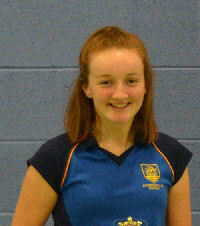 Girls Singles: Ellen Massie lost to Imogen Meldrum 21-12, 21-6 in the 1st round. Eilidh Patterson lost to 3rd seed Vibha Raman 21-4, 21-2 in the 2nd round. Eilidh Patterson lost to Charlotte Roach 21-14 in the 3rd round of the consolation knockout. Mixed Doubles: Kieran Burns & Ellen Massie lost to Harry Kerr & Anna Craig 21-23, 21-11, 21-18 in the 1st round. Kieran & Ellen won the final of the consolation knockout 21-6 against Alex Livingston & Gemma Thain. Boys Singles: Callum Stokes (2) lost the final to 1st seed Euan Cambell 21-17, 18-21, 21-7. Finlay Rhind lost to Callum Stokes 21-14, 21-9 in the 2nd round. Finlay lost to Oliver Donaldson 21-18 in the 3rd round of the consolation knockout. 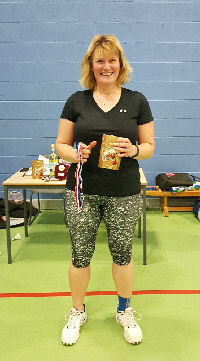 Girls Singles: Jodie Black (2) lost the final to 1st seed Lindsey Ireland 21-7, 17-21, 21-18. Sophie Anderson lost to Ciara Bailey 21-13, 21-9 in the 1st round. Sophie lost the final of the consolation knockout 21-8 to Rosie Sterk. Boys Doubles: Aidan Ferrier & Eden Bal lost to 4th seeds Nathan Findlater & Leo McMillan 21-9, 21-11 in the quarter finals. Robert Derries & Finlay Rhind lost to Robbie Davenhill & Oliver Donaldson 21-14, 21-10 in the 2nd round. Robert & Finlay lost to Neil Keenan & Andrew Savage 21-8 in the quarter finals of the consolation knockout. Girls Doubles: Sophie Anderson & Gemma Fullerton lost to 1st seeds Jess Rae & Lois Turnbull 21-2, 21-8 in the semi finals. Jodie Black & Carrie Gibson (3) lost to 2nd seeds Vibha Raman & Maithila Vijayakumar 21-9, 21-10 in the semi finals. Boys Singles: Kyle Mitchell lost to Michael Farnood 21-14, 21-14 in the 1st round. Kyle lost to Anthony Waring 21-17 in the semi finals of the consolation knockout. Boys Doubles: Ben Langley & Kyle Mitchell lost to Kyle Middleton & Kyle Short 21-6, 21-5 in the 1st round. Ben & Kyle lost to Ciaran Danks & Alan Mollins 24-22 in the semi finals of the consolation knockout. 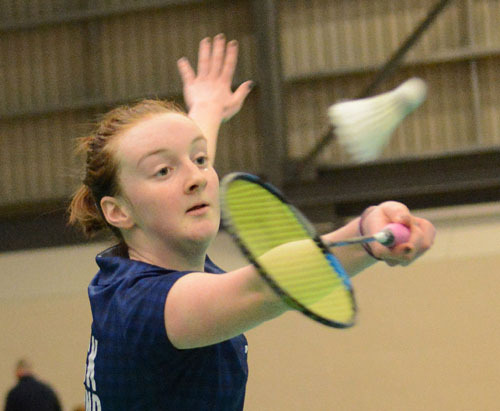 Several players from the Borders entered the recent U19 West of Scotland Championships held at the Sir Craig Reedie Badminton Scotland Centre, Glasgow on 2nd & 3rd March. In the boys singles, Callum Smith (2) lost the final to 1st seed Joshua Apiliga 19-21, 21-11, 21-10. Isaac Weir lost to Kyle Middleton 21-8, 21-9 and Kyle Mitchell lost to Antony Waring 21-12, 21-18 in the 1st round. Isaac lost the final of the consolation knockout 15-8, 13-15, 15-11 to Calvin Chan. Kyle lost to James Leggate 15-9, 8-15, 15-8 in the 1st round of the consolation knockout. In the girls singles, Jodie Black lost to Rachel Wedlock 15-21, 21-18, 21-18 in the quarter finals. In the boys doubles, Callum Smith & his partner Calum Flockhart (3) lost to Alastair Campbell & Michael Farnood 19-21, 21-18, 21-13 in the quarter finals. Kyle Mitchell & Isaac Weir playing with their respective partners Ian Campbell & Lewis Hart failed to qualify for the knockout stage. In the girls doubles, Jodie Black & her partner Eilidh McCallister failed to qualify for the knockout stage. In the mixed doubles the top four seeded pairings reached the reached the semi final knockout stage. None of the Borders players qualified for the semi finals. Well done to the players from the Borders who played in these championships. 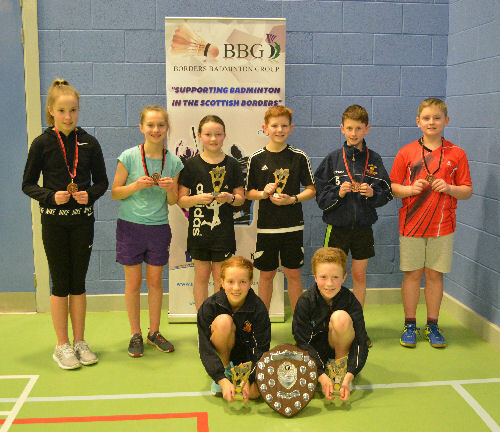 The annual Borders Primary School Championships was held at Earlston High School games hall on Saturday, 23rd February, 2019. 21 Boys and 11 girls from all over the Borders represented their respective primary schools, playing singles only. There was some great badminton on show, with many promising young & new players taking part and a good level of play being displayed, especially so in the finals. Well done to all the players for making this such a great competition. 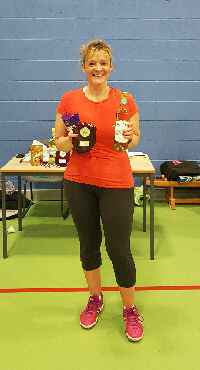 Christine Wylie, the groups Chairperson, thanked all the parents and junior players who helped score games with a special thanks to Gordon McLean and Pearl Ford for their help running the tournament from the technical table and to Audrey Rae who worked tirelessly in the kitchen serving up hot drinks and cakes. The trophies were presented by Gordon McLean. Christine Wylie gave special thanks to Dave Burns for his work behind the scenes preparing the draw, running the tournament and scoring the finals. 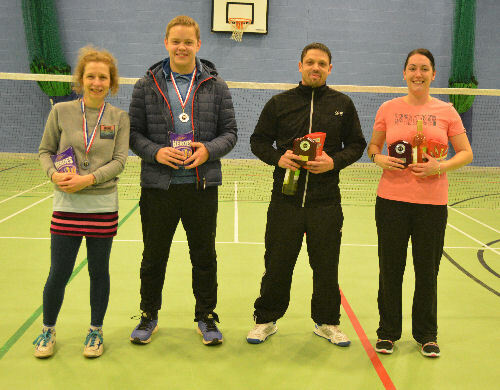 The fourth Borders Handicap Tournament of the season was held at Earlston High School games hall on Sunday, 17th February, 2019. 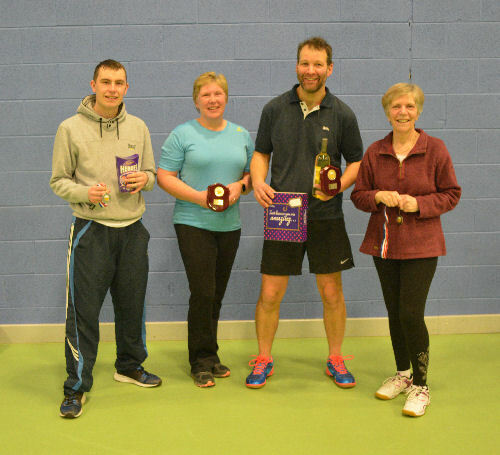 A great afternoon of badminton enjoyed by all the participants. The next handicap tournament will be held at the same venue on Sunday 17th March, 2019. 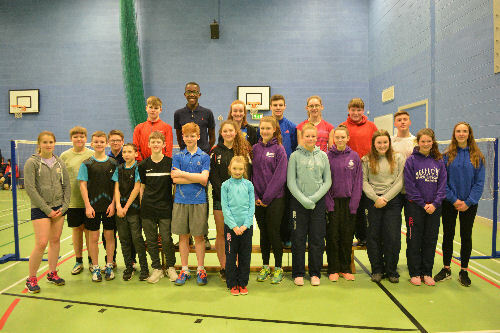 The annual Borders Secondary School Championships was held at Earlston High School games hall on Sunday, 27th January, 2019. Berwickshire High School took seven of the twelve titles available, Peebles High School took three titles with the remaining two titles going to Eyemouth High School. The day was a huge success and the standard of badminton from these fine, young players was, at times, simply breathtaking. The committee, parents and helpers rallied round doing teas/coffees and cakes, selling raffle tickets, scoring games, and running the competition from the Technical table. Committee members are working hard to ensure that badminton continues to be promoted throughout the whole of the Scottish Borders for the years to come. Large tournaments such as this takes a lot of organising behind the scenes and people probably don’t realise how much work goes into an event like this, which is all done on a voluntary basis. Dave Burns thanked everyone who helped on the day to make the event run smoothly. Audrey Rae and Myra Younger worked tirelessly in the kitchen serving up hot drinks and cakes. Pearl Ford and Lynn Rhind helped run the tournament from the Technical table with Christine Wylie. Gordon McLean, Sam Langley & David Rhind scored the finals. Christine thanked Dave Burns for all his hard work on preparing the pools to ensure that the championships ran smoothly on the day. 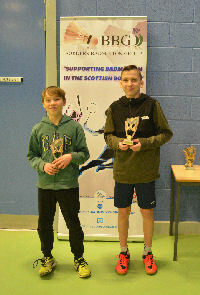 Big smash for players from the Borders who entered the U17/U19 Midland Junior Championships held at the Grangemouth Sports Complex on 19th & 20th January. 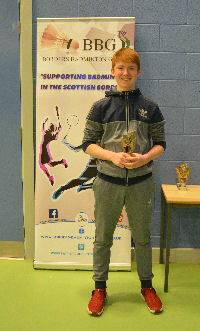 In the U17 boys singles Callum Stokes (3/4) lost the final 23-21, 21-8 to Euan Campbell. Isaac Weir lost to Euan Campbell 21-13, 21-14 in the second round. 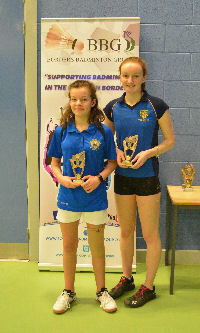 In the U17 girls singles Jodie Black (2) lost final to 1st seed Lindsey Ireland 21-17, 21-15. 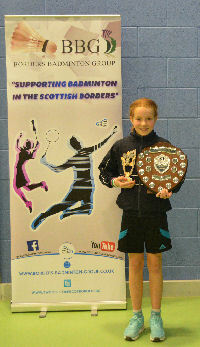 In the U17 mixed doubles Jodie Black & Lewis Hart (1) won the final 21-9, 23-21 against Joseph Carlisle & Amanda Martin. Isaac Weir & Brooke Stalker lost to Finlay Sheriff & Keryn Swan 21-19, 21-18 in the quarter finals. In the U17 boys doubles Isaac Weir & Lewis Hart (1) won the final 21-6, 22-20 against 2nd seeds Euan Campbell & Nathan MacPherson. Callum Stokes & Joseph Carlyle lost to Isaac & Lewis 21-16, 21-14 in the semi finals. In the U17 girls doubles Jodie Black & Lindsey Ireland (1) won the final 21-13, 18-21, 21-16 against 2nd seeds Brooke Stalker & Keryn Swan. 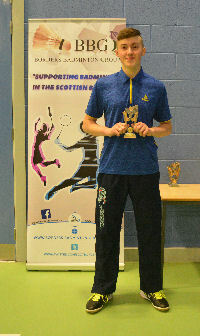 In the U19 mens singles Callum Smith (2) lost the final to Alastair Campbell (3/4) 19-21, 21-13, 21-16. In the U19 mixed doubles Callum Smith & Erin Waddell lost to 1st seeds Alastair Campbell & Lauren Page 19-21, 21-16, 21-14 in the semi finals. In the U19 mens doubles Callum Smith & Calum Flockhart had a walkover victory in the final after defeating 2nd seeds Michael McGuire & Danny Robson 21-17, 19-21, 21-12 in the semi finals. 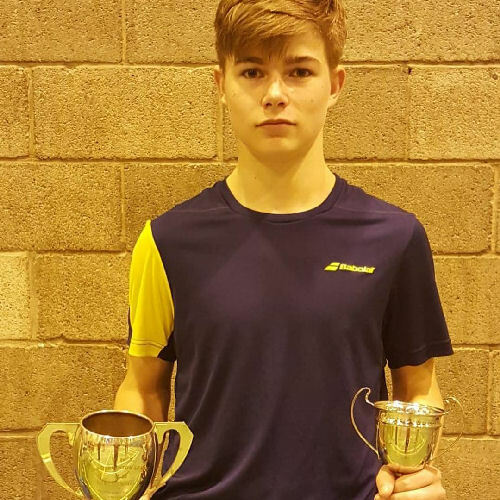 Well done to Callum Smith who won the U19 mens doubles and was runner up in the U19 mens singles, Isaac Weir who won the U17 boys doubles and Jodie Black who won the U17 girls doubles & mixed doubles titles and was runner up in U17 girls singles. Well done everyone. Great achievement. 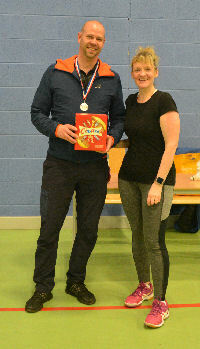 The third Borders Handicap Tournament of the season was held at Earlston High School games hall on Sunday, 20th January, 2019. The tournament was hailed as a great success by all the participants. The next handicap tournament will be held at the same venue on Sunday 17th February, 2019. 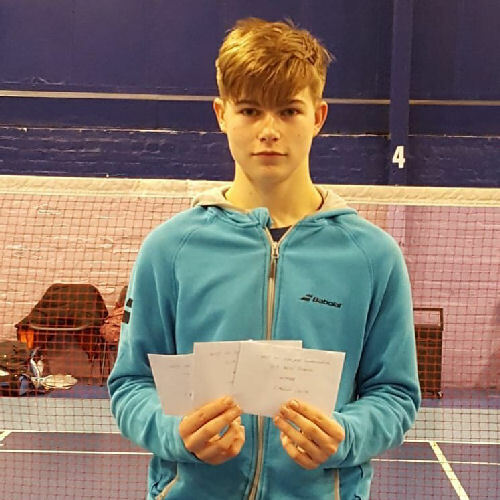 Several players from the Borders entered the U17 West of Scotland Junior Championships held at the Sir Craig Reedie Badminton Centre, Glasgow on 1st & 2nd December. 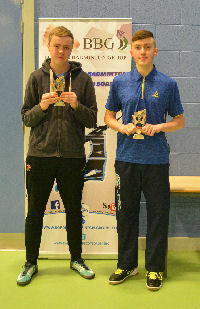 In the boys singles Callum Smith (1) won the final 21-15, 22-20 against Michael McGuire (2). Callum Stokes & Isaac Weir failed to qualify for the knockout stage. 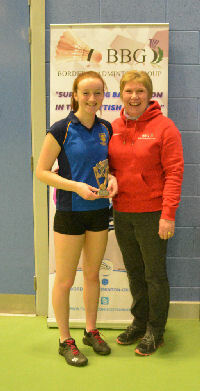 In the girls singles Jodie Black (2) lost the final 21-18, 14-21, 21-13 to Lindsey Ireland (1). 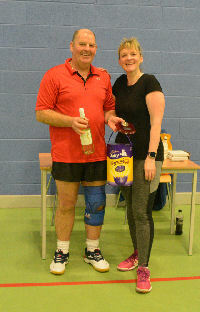 In the mixed doubles Callum Smith & Erin Waddell (2) lost the final 21-19, 21-15 to Michael McGuire & Alice Campbell (1). Jodie Black & Lewis Hart lost to Callum Smith & Erin Waddell (2) 24-22, 21-4 in the quarter finals. Isaac Weir & Brooke Stalker lost to Michael McGuire & Alice Campbell (1) 21-8, 21-6 in the first round. Isaac Weir & Brooke Stalker won the consolation final 21-12 against Ian Campbell & Emma Donald. In the boys doubles Callum Smith & Calum Flockhart (1) lost the final 21-19, 21-15 to Kenneth Cheung & Michael McGuire (2). Isaac Weir & Lewis Hart lost to Callum Smith & Calum Flockhart (1) 21-7, 21-19 in the semi finals. Callum Stokes & Joseph Carlyle lost tp Kenneth Cheung & Michael McGuire (2) 21-18, 21-15 in the quarter finals. 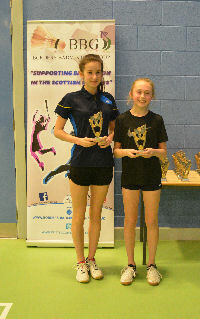 In the girls doubles Jodie Black & Eilidh McCallister won the final 22-20, 22-24, 24-22 against Jodie Harris & Erin Waddell (1). 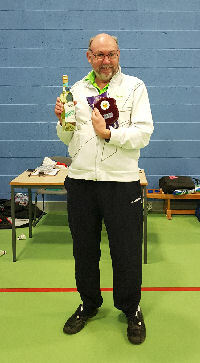 Well done to Callum Smith who won the boys singles and was runner up in the mixed & boys doubles. 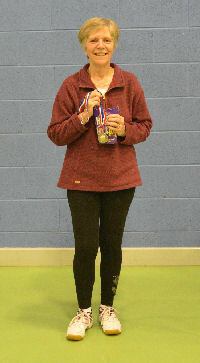 Jodie Black won the girls doubles and was runner up in the girls singles. Well done everyone. 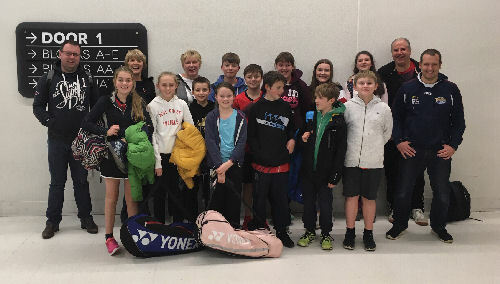 Once again the Borders Badminton Group organised a bus trip for youngsters, parents and coaches to travel to the finals day of the Scottish Open Grand Prix event on Sunday, 25th November, 2018 which was held at the Emirates Arena, Glasgow. It was a great day out for everyone concerned. 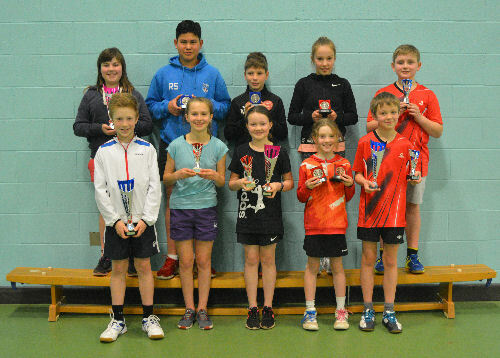 The youngsters took part in the badminton festival held in the morning and in the afternoon everyone watched the final matches of the ladies doubles, ladies singles and gents doubles. Special thanks to Myra Younger & Audrey Rae for organising the bus trip. 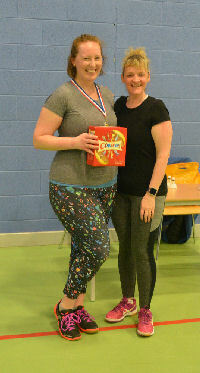 The second Borders Handicap Tournament was held at Earlston High School games hall on Sunday, 18th November, 2018. The tournament was hailed as a great success by all the participants. The next handicap tournament will be held at the same venue on Sunday 20th January, 2018. 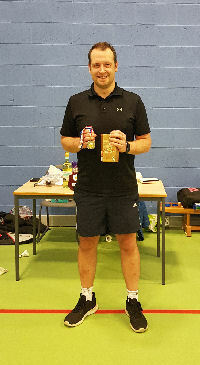 Borders badminton squad training session with Badminton Scotland coach, Dan Travers at Earlston High School on Sunday, 11th November, 2018. 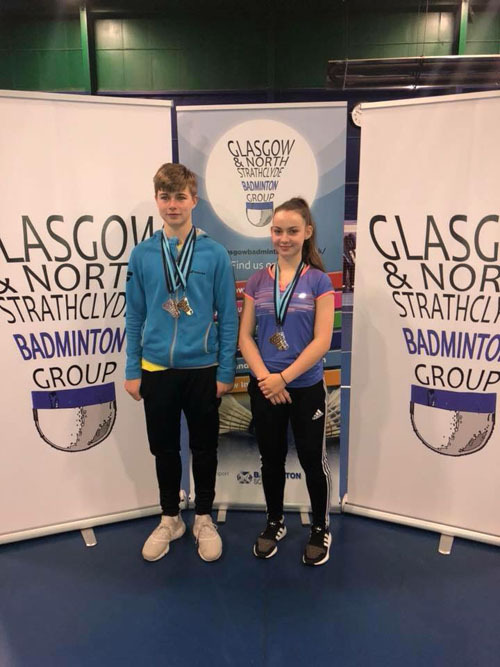 Big smash for players from the Borders who entered the U17/U19 East of Scotland Junior Championships held at the Jack Kane Sports Centre, Edinburgh on 10th & 11th November. 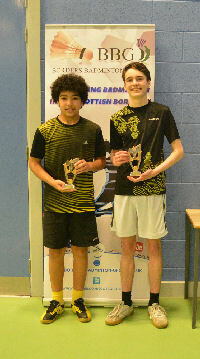 In the U17 boys singles Isaac Weir lost the final 13-21, 21-17, 21-17 to Lewis Hart (3/4). Isaac beat 1st seed Calum Flockhart 12-21, 21-19, 21-15 in the semi finals. Callum Stokes lost to Nathan MacPherson 17-21, 21-13, 21-18 in the first round. 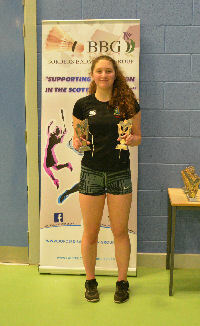 In the U17 girls singles Jodie Black (2) lost final to 1st seed Lindsey Ireland 18-21, 21-17, 21-11. 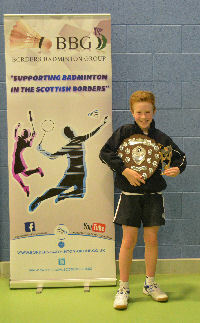 In the U17 mixed doubles Callum Smith & Erin Waddell (1) won the final 21-12, 21-13 against Isaac Weir & Rachel Broadley. Isaac & Rachel knocked out 2nd seeds Calum Flockhart & Jodie Harris 12-21, 21-18, 21-19 in the semi finals. Jodie Black & Lewis Hart lost to Calum Flockhart & Jodie Harris (2) 21-14, 21-14 in the quarter finals. In the U17 boys doubles Isaac Weir & Lewis Hart (1) won the final 21-16, 19-21, 21-18 against 2nd seeds Euan Campbell & Nathan MacPherson. Callum Stokes & Joseph Carlyle lost to Isaac & Lewis 26-24, 16-21, 21-10 in the semi finals. 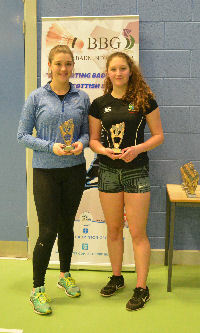 In the U17 girls doubles Jodie Black & Eilidh McCallister (2) won the final 21-12, 21-12 against 1st seeds Rachel MacLean & Erin Sinclair. 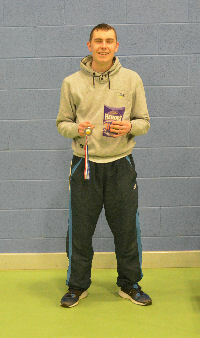 In the U19 mens singles Callum Smith (2) won the final 21-11, 21-14 against 1st seed Alastair. Kyle Mitchell lost to Kenneth Cheung 21-10, 21-10 in the second round. 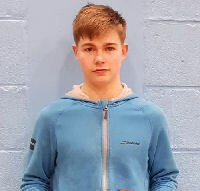 In the U19 mens doubles Callum Smith & Calum Flockhart (2) lost the final 21-17, 20-22, 21-15 to 1st seeds Michael McGuire & Danny Robson..
Well done to Callum Smith who won the U17 mixed doubles and U19 mens singles and was runner up in the U19 mens doubles. 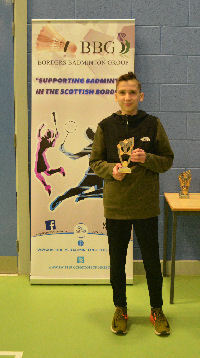 Isaac Weir won the U17 boys doubles and was runner up in the U17 boys singles and mixed doubles. 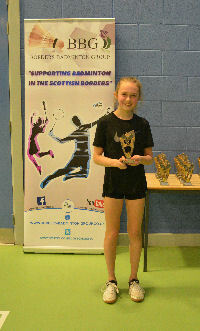 Jodie Black won the U17 girls doubles and was runner up in U17 girls singles. Well done everyone. 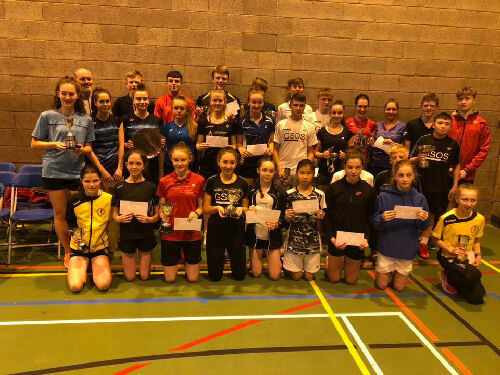 Several players from the Borders entered the recent U19 Highland Junior Championships held at Inverness Royal Academy, Inverness on 4th November. 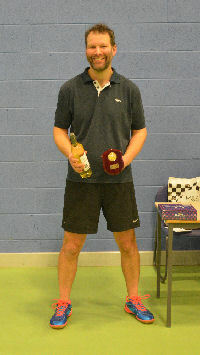 In the boys singles, Callum Smith (1) won the final 21-11, 21-4 against Marc Graham (3/4). Callum Stokes lost to Callum Smith 21-11, 21-15 in the semi finals. In the mixed doubles, Callum Smith & his partner Erin Waddell (1) won the final 21-7, 21-12 against 2nd seeds Marc Graham & Rachel MacLean. In the boys doubles, Callum Smith & Isaac Weir (1) won the final 21-12, 21-6 against 2nd seeds Nathan MacPherson & Connor McRobbie. Callum Stokes & his partner Joseph Carlyle lost to Callum Smith & Isaac Weir 21-15, 21-12 in the semi finals. 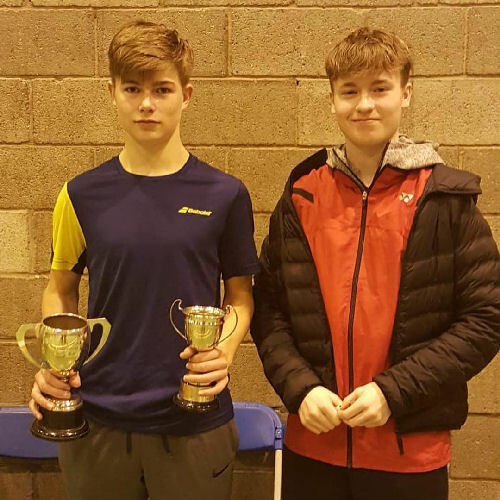 Congratulations to triple title winner Callum Smith and to Isaac Weir on winning the boys doubles title and well done to Callum Stokes who reached the semi finals of the boys singles and doubles Well done everyone. 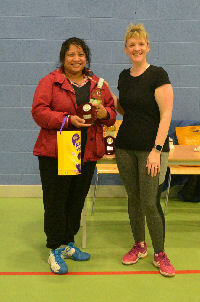 The inaugural Borders Handicap Tournament was held at Earlston High School games hall on Sunday, 14th October, 2018. The tournament was hailed as a great success by all the participants. The next handicap tournament will be held at the same venue on 18th November, 2018. 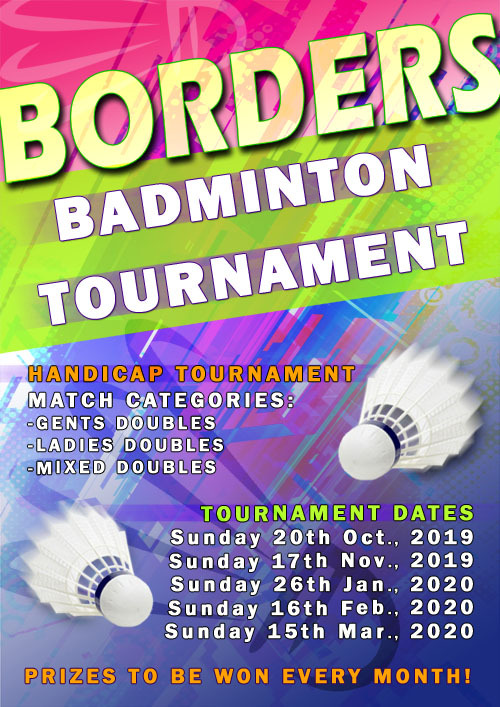 Over the past few years it has become increasingly difficult to run the Borders Badminton League in its current form with several fixtures being cancelled. 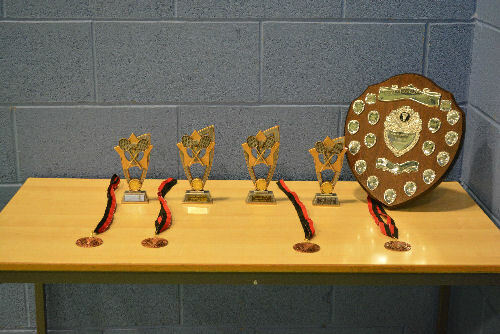 The Sunday afternoon tournaments will commence at 1-30pm in the main games hall at Earlston High School. Each tournament will be played to a conclusion on the day of the tournament so players do not need to worry about not being available for a particular tournament date. Players will be given a handicap at the start of the tournament. Players will play with a different partner in each game with each game being played to 21 points. Only one game will be played with each partner. 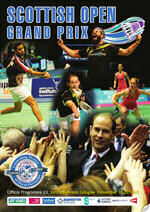 Games will comprise level and mixed doubles only. At the start of each game the handicaps of each pairing is added together and that will be the handicap used in the game. After each game the points that each player scores will be added to their overall score. Players do not necessarily need to win each game to win the tournament or be runner up. Handicaps will normally be adjusted after each tournament but may also be adjusted during the tournament by the tournament referee. The tournament entry fee will be £5/player. The tournament will be open to anyone age 16, or older. Each player will play the same number of games on the day of the tournament with the top two lady and gent scorers emerging as winners and runners up. Please download the poster and share it with your club members. It is important that details of this new handicap tournament are circulated to ALL the clubs in the Borders. To enter the tournament in October please either add your name to the event that has been created on Facebook or add your name below the Facebook thread using 'Comment' before the end of September to allow the committee to meet and set the initial handicaps. Clicking 'Like' will not be taken as your intention to play in the tournament. Alternatively, please inform any member of the committee before the end of September that you would like to enter the tournament. 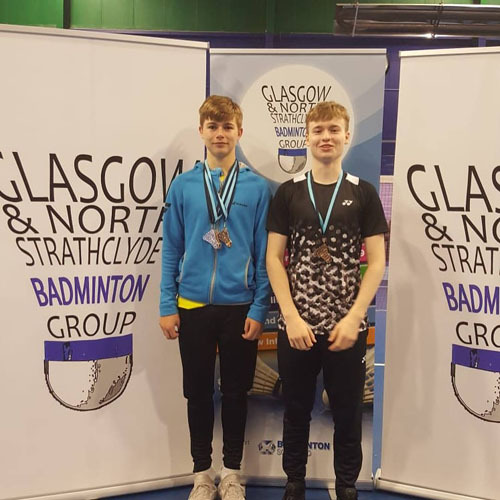 Several players from the Borders entered the recent U19 Glasgow Junior Championships held at the Sir Craig Reedie Badminton Scotland Centre, Glasgow on 22nd & 23rd September. In the boys singles, Callum Smith (3/4) lost to Michael McGuire 10-21, 21-18, 21-19 in the quarter finals..Isaac Weir lost to Jack Riddell 21-7, 21-9 in the 2nd round. Kyle Mitchell lost to James Leggate 21-14, 21-15 in the 1st round. Kyle lost to Fraser Sheriff 15-10, 15-3 in the 1st round of the consolation knockout. In the girls singles, Jodie Black lost the Maria Leith 21-15, 11-21, 21-16 in the 1st round. Jodie was beaten by Rachel Wedlock 15-10, 9-15, 15-10 in the quarter finals of the consolation knockout.. In the boys doubles, Callum Smith & his partner Calum Flockhart failed to qualify for the knockout stage. Isaac Weir & his partner Lewis Hart also failed to qualify for the knockout stage. In the mixed doubles, Callum Smith & his partner Erin Waddell lost to Michael McGuire & Alice Campbell 21-16, 11-21, 21-8 in the 1st round. Jodie Black and her partner Lewis Hart also lost in the 1st round to Calum Flockhart & Jodie Harris 21-7, 21-15. Callum Smith & Erin Waddell reached the final of the consolation knockout but were beaten by Josh McKay & Maria Leith 15-11, 15-12. Jodie Black & Lewis Hart lost to Callum Smith & Erin Waddell 15-5, 15-12 in the quarter finals of the consolation knockout. Well done to the players from the Borders who played in these championships. Entering the U19 age group is a big step up for these young players. Well done everyone. 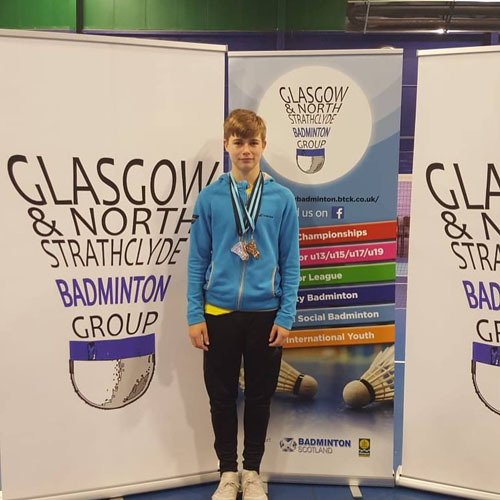 Several players from the Borders entered the recent U17 Glasgow Junior Championships held at Craig Reedie Badminton Scotland Centre, Glasgow on 8th & 9th September. 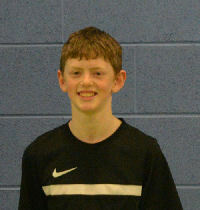 In the boys singles, Callum Smith (1) won the final 21-17, 22-20 against Michael McGuire (3/4). Callum Stokes lost to Fraser Sheriff (5/8) 21-19, 21-10 in the 2nd round. Isaac Weir lost to Lewis Hart (5/8) 23-21, 22-20 in the 2nd round. 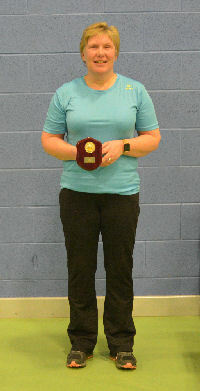 In the girls singles, Jodie Black (3/4) lost the final to Lindsey Ireland (2) 21-12 21-19. In the boys doubles, Callum Smith & his partner Calum Flockhart (1) won the final 21-10, 17-21, 25-23 against Kenneth Cheung & Michael McGuire (2). Isaac Weir & his partner Lewis Hart (3/4) lost to Callum Smith & Calum Flockhart (1) 21-7, 21-12 in the quarter finals. Callum Stokes & his partner Joseph Carlyle lost to Marc Graham & Fraser Sheriff (3/4) 14-21, 21-14, 21-17 in the quarter finals. 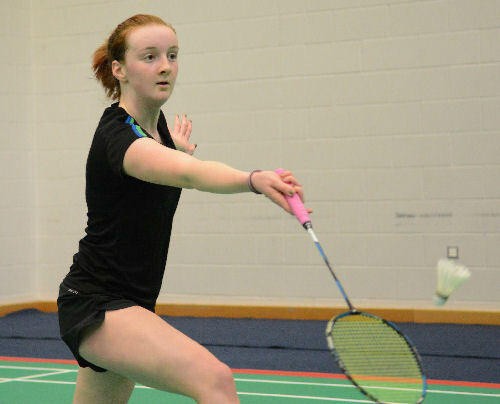 In the girls doubles, Jodie Black & her partner Eilidh McCallister (3) lost to the 2nd seeds Jodie Harris & Erin Waddell 21-12, 21-13 in the semi finals. In the mixed doubles, Callum Smith & his partner Erin Waddell (2) lost the final 21-8, 21-19 to the 1st seeds Michael McGuire & Alice Campbell. Jodie Black & her partner Lewis Hart lost to Michael McGuire & Alice Campbell 21-12, 21-19 in the quarter finals. Isaac Weir & his partner Brooke Stalker lost to Jodie Black & Lewis Hart 21-16, 20-22, 21-19 in the 1st round. 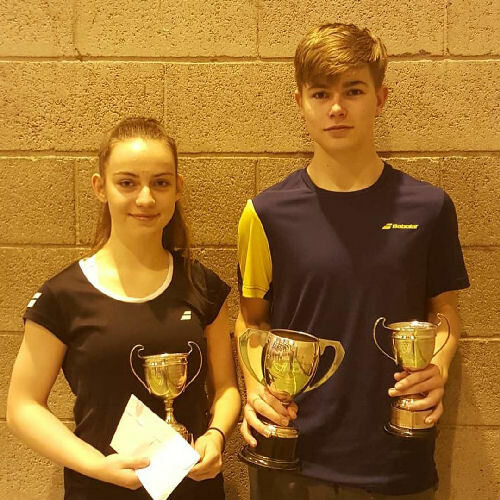 Well done to Jodie Black who reached the final of the girls singles and to Callum Smith who won the boys singles & doubles and who reached the final of the mixed doubles and to all the other players who played in these championships. At the end of your very kind 3 year sponsorship of £500 per annum towards the costs of hiring facilities for our Borders badminton squad training and competitions, I write to extend our sincere thank you for your invaluable support, the sponsorship made a huge difference to our funds and took so much pressure off our expenditure. As a group we are looking forward to the start of the season and encouraging more young players into the life long sport of badminton. Please feel free to follow us on our website and Facebook page. Once again, thank you so very much for your sponsorship and support. The Group would like your help in securing sponsorship for the forthcoming season. If you are aware of any local individuals or companies that you feel may be willing to sponsor the Group, the committee would appreciate your help by sending them a copy of the following letter. The letter can be downloaded in PDF format using the following link. Thank you. 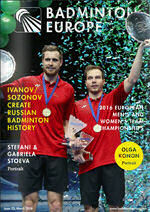 I am writing to you regarding a sponsorship opportunity within the Borders Badminton Group. 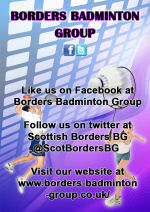 Our group has been in existence for more than 30 years and we support and promote Borders Badminton to all age groups. Our main aim is to coach performance and development squads aging from 8-17 year olds, primarily at club level with a main focus on support for our junior players. The Group play competition level badminton representing the Borders at a number of competitions outside the Border region, for example Tyneside, Lothian, Perth, Glasgow and Wishaw. The group also organises Primary and Secondary School Competitions within the Borders, to enable all abilities to play, join in and compete. Over the years many of the Borders squad players have gone onto compete at National level which is a great honour for the region, players, families, their schools and clubs. We have previously never been in the position where we have had to seek sponsorship to aid with the costs of the hall hire and shuttle fees for training, but five years ago badminton lost its target sport status within the Borders which meant we have lost an annual income of £3,000. This has proved a hard blow to the Borders but following this Borders Sports councils have retracted funding for groups and prefer to aid individuals and clubs. This means the loss of £300 from the 4 sports councils leaving us with the only income this year from parents or guardians of the players (who already support with travel and sports equipment costs). The types of annual costs are: our hall fees are approx £1100; shuttles cost £600; competition entry can cost up to £4000 alone to allow three different age groups the opportunity to participate. We have previously been privileged to receive a three year sponsorship which covered a partial cost of the hall rental, this has now come to an end. 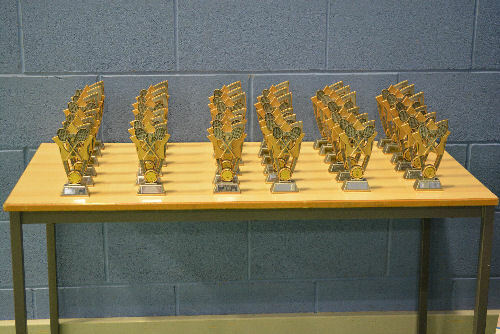 A local Border sponsor has generously sponsored our trophies (and also supports with coaching within the group). Administration costs are also provided by another local company (along with more coaching support). All of which have been greatly received. As a group we fully appreciate the Scottish Borders is one of the most generous (and active) areas in Scotland when it comes to sports sponsorships. 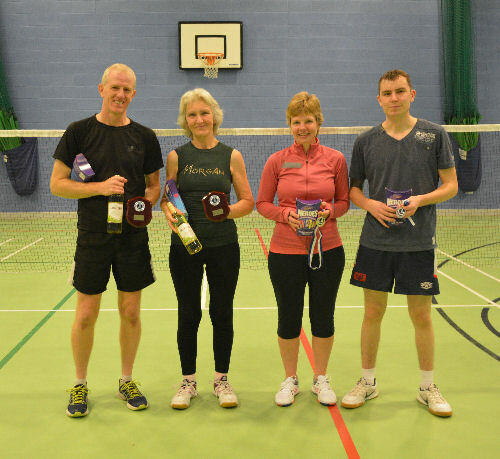 Borders Badminton can offer great exposure for a local brand, with shirt logos, press coverage post events, along with club and interclub social media coverage. If you would like more information on our organisation, please feel free to make contact with us. Season 2017/2018 has now been archived but you can still access all the competition results, photo's and videos from last season using the following link. Click here for season 2017/2018. Season 2016/2017 has now been archived but you can still access all the competition results, photo's and videos from last season using the following link. Click here for season 2016/2017.